The third and final Test is currently in progress. 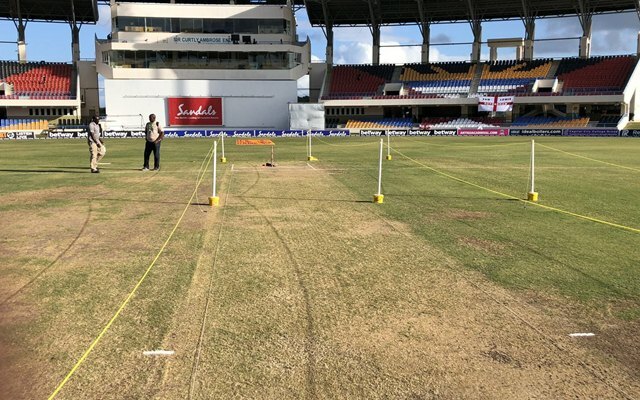 Mr Crowe cited the uneven bounce at the southern main pavilion end as the reason for the rating in his report, which has been forwarded to Cricket West Indies. In the revised ICC Pitch and Outfield Monitoring Process, which was introduced on 4 January 2018, if a pitch or outfield is rated as being substandard, that venue will be allocated a number of demerit points. No demerit point will be awarded when the outfield is rated as below average, but two and five demerit points will be awarded to venues whose outfields are marked as poor and unfit, respectively. Demerit points will remain active for a rolling five-year period. As far as the match is concerned, the Caribbean side won it by 10 wickets comfortably. Their pacers had the England batsmen on their toes every time and the side which famously whitewashed Sri Lanka at home couldn’t handle the heat. The skipper Joe Root is having a terrible time both as a captain and batsman and his woes continued in the final Test match as well when he got out after scoring only 15 runs. CT 2017: What will happen if both the games of Group B are washed out?